Exploring the simple mathematical relationships that underlie the cycles of the solar system and the music of Earth, Heath reveals how Neolithic astronomers discovered these ratios using megalithic monuments like Stonehenge and the Carnac stones, discoveries that informed later myths and stories including the Epic of Gilgamesh, the Resurrection of Osiris, the Rg Veda, the Hebrew Bible, Homer’s epic tales, and the Return of Quetzalcoatl. He explains how this harmonic planetary knowledge formed the basis of the earliest religious systems, in which planets were seen as gods, and shows how they spread through Sumer, Egypt, and India into Babylon, Judea, Mexico, and archaic Greece. He exposes how the secret knowledge encoded within the Bible’s god YHWH was lost as Greek logic and reason steadily weakened mythological beliefs. Revealing the mysteries of the octave and of our musical scales, Heath shows how the orbits of the outer and inner planets gave a structure to time, which our Moon’s orbit could then turn into a harmonic matrix. He explains how planetary time came to function as a finely tuned musical instrument, leading to the rise of intelligent life on our planet. He demonstrates how this harmonic science of numbers can be read in the secret symbolism and sacred geometry of ancient cities such as Teotihuacan and in temples such as the Parthenon, connecting the higher worlds of planetary time and harmonics with the spiritual and physical life on Earth. Recasting our understanding of the solar system, Heath seeks to reawaken humanity’s understanding of how sacred numbers structure reality, offering an opportunity to recover this lost harmonic doctrine and reclaim our intended role in the outer life of our planet. 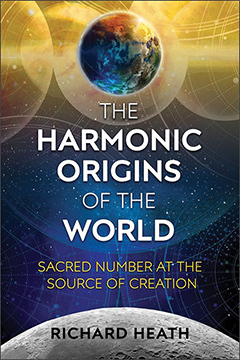 THE HARMONIC ORIGINS OF THE WORLD: Sacred Number at the Source of Creation By Richard Heath. 272 Pages. 6x9 Paperback. Illustrated. Bibliography.